Paper enlists readers to help it select "The Best Irish Pub in the World (Outside Ireland)." Any day now, The Irish Times will announce “The Best Irish Pub in the World (Outside Ireland).” Among the ten selected finalists are two U.S. establishments: Finn McCool’s in New Orleans and Irish Haven in Brooklyn. We were the lads who lived upstairs, 13 of us in an unfurnished, apocalyptic, three-bed apartment that served as the living quarters for all of Brooklyn Shamrocks CLG’s summer transfers. Freddie, a Galwegian cancer survivor and Vietnam veteran who was at one time homeless for 13 years in the NYC subway, would be trying to hustle us at pool. Later, if he had sobered up, he’d stick the Dubliners on the jukebox in tribute. 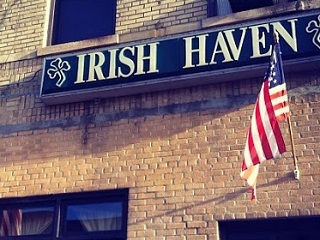 The pub has been used as a shooting location for everything from The Departed to Gotham. As part of the final round, each of the nominated ten establishments was visited by Irish Times researchers. A panel of three judges will select the winner.